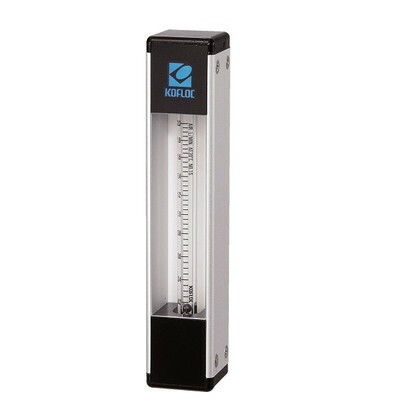 This top-grade high-precision area flowmeter is a fruit of KOFLOC's challenge to boost the general perception currently conceived by people of flowmeter of being a "mere yardstick" into a new conception that a flowmeter is a "precision instrument." This flowmeter particularly features its uniquely precision-formed glass tube and ultra-precision ball float. Can measure a wide range of flows from ultra-minute flows of 0.5-3ML/MIN to flows of 3-30 L/MIN. High precision measurement of flows is available up to ±2% of full scale (standard specification) or to ±1% of full scale (optional specification). A broad range of variations is available in total length, materials of construction, flow rate, pressure, scale, and so forth to meet diverse applications from a variety of fields. Practically all kinds of gases can be measured, not to mention those standard (Air, N2, O2, H2, He, Ar and CO2).